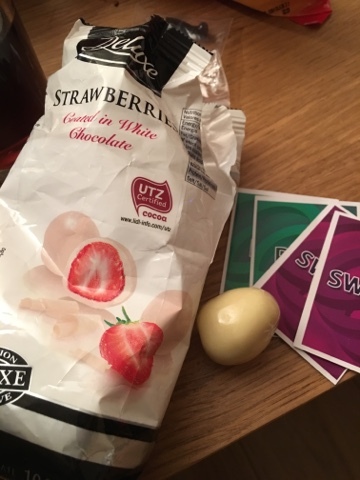 For the midnight celebrations here in the UK we invited Friends round who brought bonus snacks. 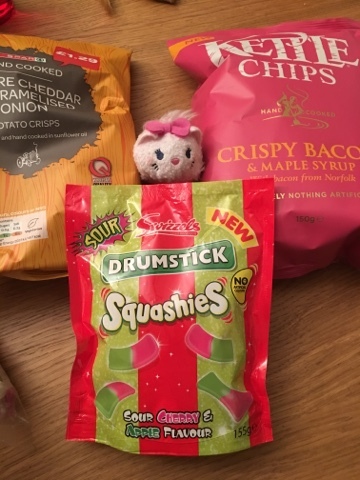 While I didn't really sample much of the crisps due to being full of pizza I did eat a few of the Squashies - which were hailed as the best sweet ever by the person who brought them round! 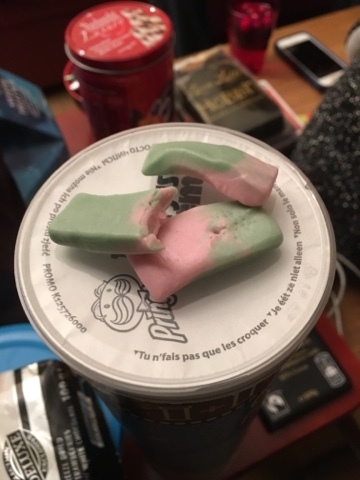 They are part foam shrimp, part sour gum and with the flavours of a drumstick lolly. They were a lot more edible than I'd suspected, having non of the annoying sticky parts of the drumstick, but near identical flavours. These are a hit, and ideal for parties and gaming sessions as you can throw them about and cause no damage to the game or the target. I'm left wondering if there are other flavours to try - these being the mixed sour variety makes them taste a bit like Vimto. 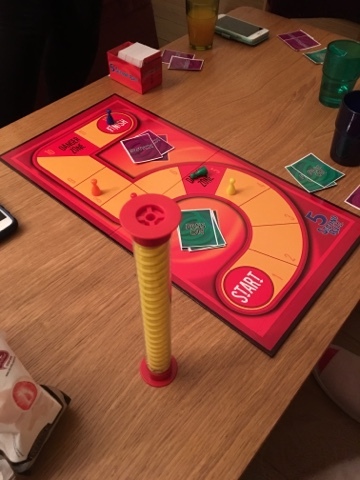 Here is 5 second rule - not so much a game as a series of fast mini quizzes like 'name three supervillains' in 5 seconds, while everyone else tries to put you off so they can steal the question. Good fun. And what better to augment this than chocolate coated fruit - from my last minute pre Christmas Lidl run I think. As you can see these are whole freeze dried strawberries with a good millimetre of chocolate on the outside and some kind of melt proof coating. 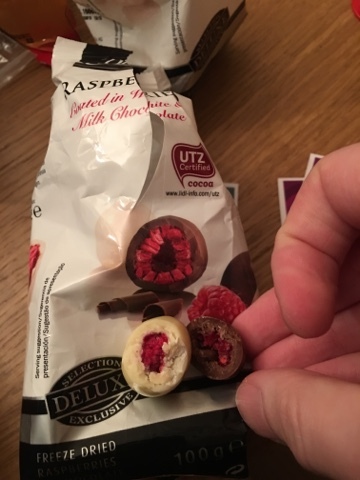 The raspberries have a darker chocolate too! While people ate these at the party they were less of a hit and there were lots remaining afterwards. This was not an issue as I loved them and took them to the cinema where they were ideal. Not too big to pop right in, and not too noisy to disturb people. I finished the bags during the cinema version of the new Christmas Sherlock episode. I think these will be pretty seasonal so I'm unlikely to get more just due to the sheer amount of chocolate that I seem to have in the house due to festive reasons. Maybe I'll pick some up next year as I guess that they are a little more nutritious than the alternative popcorn snacks.